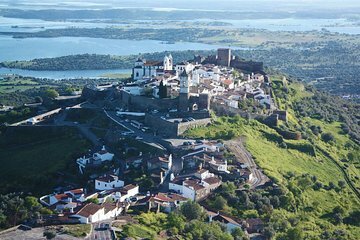 Visit two of Portugal's most ancient cities on a private day trip to Monsaraz and the UNESCO-listed Evora. Travel directly from your hotel through the cork trees and vineyards of the Alentejo region in a private vehicle, making it easy to see landscapes that most visitors to the capital miss. Explore monuments like a Roman temple, Moorish remnants, and a hisstop castle, taking a break to enjoy a typical Portuguese meal at a hand-picked restaurant.